Are you looking for the must try things in Brussels? Well, there are a lot of them but these three must be included in your list for a full Brussels experience. Considering that Brussels is the official capital of the European Union and home to a large number of associations and institutions in Europe, it was inevitable for Brussels to offer a Europe simulation for its visitors, in most realistic way possible. Mini Europe is a leisure park which is set on 25 hectare space. The park includes some of the most iconic landmarks of the European countries’ displays, which are created in 1/25 of the original size. You can get a picture in front of the Eiffel and then see the famous windmills of the Netherlands. The whole experience is enjoyable and informative, especially if you have travelled to Brussels outside of Europe. The mini displays of the icons of European countries are not the sole things that Mini Europe offers to its visitors. A water park, a cinema complex and nice cafes are located inside to make sure the visitors make the most out of their visit. The needed information about the directions, opening times and fairs can be seen on the official website of Mini Europe. Not visiting a Brewery when you are in the heaven of beers in the world would be a mistake. Cantillon Brewery on the other hand, is more than special to be called, “just a brewery”. You may already heard of Cantillon beer since it is worldwide famous. 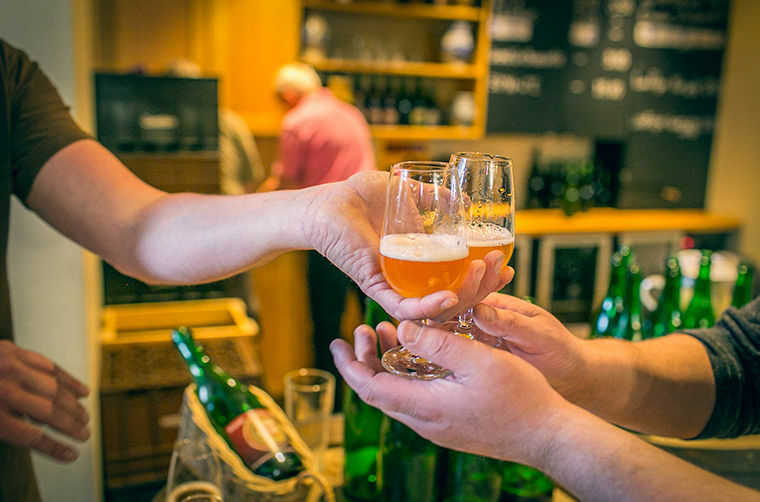 The brewery is the last traditional gueuze/lambic brewery in Brussels and therefore must be included in the list of places to visit if you are into get to know more of the history of beer in Belgium and its importance to the country. The Cantillon Brewery is easily accessible since it is located 15 minutes of walk from the Grand Place. When you arrive, you are going to be asked if you would like to take a tour. The tour is highly recommended by the visitors since it is not expensive and you are getting load of information about the place and beer from the experts and 2 beer tastings are included in the price. The opening times and information about tour reservations can be found on the official website of the Cantillon Brewery. There are some cities in the world that offer a somehow different shopping experience to its visitors. You already know the local souvenirs when you get there or you are told which part of the city to go to get the best deals. Brussels is one of them. If you want to experience a shopping style which is still popular in Europe, you can try the flea markets in Brussels. Jeu de Balle Flea Market is actually popular in whole Belgium and people living nearby cities travel to Brussels just for the shopping options offered in this market. It is common to encounter some gems that are from different periods in time. You can consider yourself to be lucky if you are into antiques. Brussels has got one of the best antique markets ever. Place du Grand Sablon is a great place to dig into things that have been taken care of really well up until today. There are things you should buy from Brussels such as beer (do that, put some unique tastes in your luggage and enjoy it when you arrive back home), chocolate and lace. You are going to come across a large number of stores that sell these. In addition, if you want to check out the malls in Brussels, you can check Galeries Saint Hubert-Sint Hubertusgalerijen (which is the very first mall in the world, opened in 1847), Galeria Inno and Woluwe Shopping Center.